Located in the Upper East Side's exclusive Gold Coast, 10 East 68th Street, Apt. 4, is a rarely available, mint condition duplex featuring two bedrooms and two and a half bathrooms in a prewar, elevator limestone mansion. 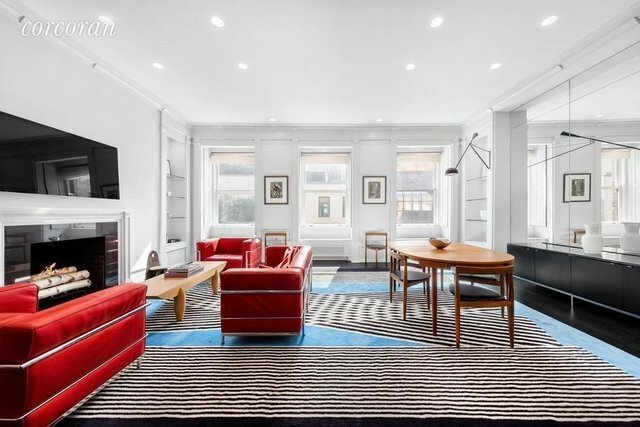 This pristinely renovated home spans nearly 1,450 square feet and boasts rich prewar detail seamlessly blended with high-end, custom finishes throughout as well as hardwood floors, recessed lighting and a wood-burning fireplace. Upon entering through the semi-private elevator landing, you will be welcomed into the spacious and elegant south-facing living and dining room that features three oversized windows, 10'4" ceilings and built-in shelving. The contemporary galley kitchen is open to the living room via a two-way smoky mirror and has custom, high-gloss cabinetry, granite countertops, and a suite of stainless steel appliances including a 5-burner, vented cooktop from Gaggeneau, Liebherr fridge, dual wall ovens, a wine refrigerator and generous counter and storage space. There is also a half bath on this level. The private upper level contains two pin-drop quiet south-facing sleeping quarters, two full bathrooms and washer and vented dryer from Miele. The master bedroom has an en suite bath and large dressing area with fully-outfitted closets and custom built-ins. The spa-like five-piece bath is the epitome of luxury with statuary marble walls in 16" x 16" slabs, mosaic marble floors, a deep-soaking tub encased in 1 ¼" slab marble, a custom double-sink vanity and an extra-large glass-enclosed shower with rain shower head and fixtures from Kallista. The amply-sized second bedroom has custom built-ins and just outside is a generous, outfitted walk-in closet and a second marble bathroom down the hall.Additional features of this immaculate home include a video intercom security system, built-in speaker system, and lots of storage and closet space throughout. The unit also benefits from partial ownership of the ground floor commercial space whose rent offsets this unit's monthly maintenance charges.Originally built in 1882, the Lamb Wheeler Mansion is an intimate, 4-unit cooperative that allows 50% financing, pied-a-terre's and is pet-friendly upon Board approval. Located on a lovely tree-lined street just a half block from Central Park and the high-end fashion boutiques along New York City's famed Madison Avenue, the coop has excellent financials and no flip tax.